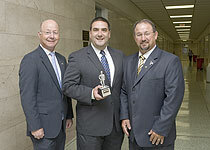 Reps. Dan Moul and Will Tallman receive the Guardian of Small Business award from Kevin Shivers, state director of the National Federation of Independent Business in recognition of their support of small businesses in Pennsylvania. Reps. Dan Moul (R-Adams/Franklin) and Will Tallman (R-Adams/York) are being recognized for their support of small businesses in Pennsylvania. Moul and Tallman are two of only 16 members of the General Assembly to receive this year’s Guardian of Small Business Award from the state leadership council of the National Federation of Independent Business (NFIB). There are many small businesses in both Moul and Tallman’s legislative districts. Chief among them are farmers and fruit growers, wineries and other agriculture-related endeavors, as well as tourism and retail businesses, just to name a few.